"My mom would make this for us growing up. It was one of those easy dinners that we all loved to eat at the family table. Now we are still passing it down. My 17-month-old daughter LOVES this recipe. You can add other vegetables if you want (i.e. green onions, fennel, mushrooms, etc.). It can also be made with ground pork." Mix ground beef, oats, egg, Worcestershire sauce, ketchup, water, dried minced onion, salt, and pepper in a bowl until evenly combined; shape into 6 oval-shaped patties. Heat a large skillet over medium heat. Cook patties in hot skillet until browned completely, 2 minutes per side. Transfer browned patties to a baking dish. Top patties with onion rings. Stir mushroom soup and milk together in a bowl; pour over patties. Cover baking dish with aluminum foil. Bake in preheated oven until firm, hot, and grey in the center, about 45 minutes. An instant-read thermometer inserted into the center should read 160 degrees F (70 degrees C). 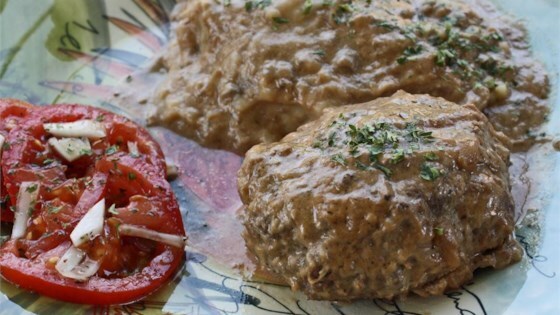 See how to make quick and easy Salisbury steak with a rich brown gravy. Pretty tasty; I also added a pkg. of dry onion soup mix to the gravy for extra taste. This was real good. Easy, Moist and flavorful. Will make this again. I tried this receipe. It did not taste good and it was to soft and the cream of mushroom soup was to runny. I did not like it and also my husband did not like it, and he usually eats every thing.